The MMORPG "The Elder Scrolls Online" has received on the PC an extension called "Clockwork City". Furthermore the update 16 with numerous adaptations and innovations was released. Bethesda Softworks and ZeniMax Online have published the "Clockwork City" extension for the MMORPG "The Elder Scrolls Online". From now on, PC and Mac players can buy the latest DLC expansion at a price of 2,000 crowns. Furthermore, all ESO Plus members can download the extension for free. Investigate A String Of Mysterious Murders - Throughout Tamriel, important guilds, diviners, scholars, and planar archaeologists are killed by their own shadows and touch you to find out why these lethal assaults. Discover The Secrets Of The Clockwork City - Its existence is a closely guarded secret and only very few elected by the Sotha Sil circle know the location. But now the most intrepid explorers will enter for the first time in the mechanical masterwork of the Clockwork God in The Elder Scrolls Online. 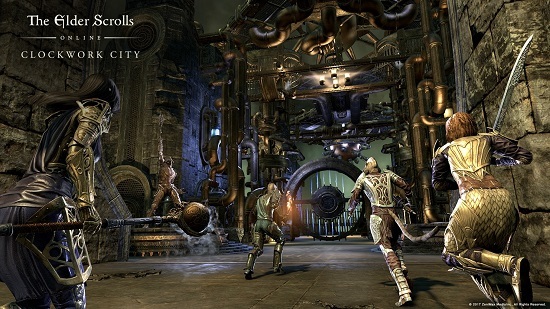 Come Face To Face With Mechanized Wonders - By exploring Clockwork City, you will find that it is both a laboratory and a testing ground for Sotha Sil's mechanical creations, dangerous living machines that are so fascinating as lethal. A Whole New Realm To Explore - In the DLC Clockwork City you must unveil a Daedric conspiracy, but it is the whole realm to be a mystery in itself, so it could be its nature and its purpose to represent the greatest enigma! Furthermore, the developers have provided free update 16, which includes various corrections, balance changes, performance enhancements, support for the Xbox One X, and a feature tracking feature. Who owns "The Elder Scrolls Online: Morrowind" can also expect a new Battlegrounds mode. This is the "Crazy King". Further details can be found on the official website.